Amazon Business has everything you love about Amazon, tailored for the public sector, including state and local government agencies, public and private K-12 school districts and higher education organizations, and nonprofit businesses. With tax-exempt purchasing, price discounts and other features optimized for the public sector, Amazon Business is a powerful procurement option for your organization. The OMNIA Partners contract can help you improve the way you buy items for work. “Amazon Business delivers the buying experience our end-users want, and we are thrilled to provide the contract vehicle for this extensive nationwide online marketplace,” said Anthony Crosby, Administrative Coordinator of Purchasing for Prince William County Public Schools (PWCPS). PWCPS serves as the lead public agency for the contract, which was awarded to Amazon Business after completing a competitive solicitation and thorough evaluation process. Step 1: Registered with OMNIA Partners? Sign up for a free Amazon Business account. Contact an Amazon Business Customer Advisor to complete enrollment. *If you are registered with OMNIA Partners and have an Amazon Business account, you must Enroll Today to get connected to the OMNIA Partners contract. If you do not have an Amazon Business account, you must go through a two-step process to Sign-up and Enroll Today to get connected to the OMNIA Partners contract. From office supplies to musical instruments to those hard to find items. Amazon Business offers millions of business products, and we’re adding more business items and suppliers every day. Whether it’s a 3D printer, art supplies or books, you’ll find it on Amazon Business. Below are the awarded categories through the OMNIA Partners contract. Amazon Business has the tools your team requires to purchase whatever your organization needs. Connect your team, create purchasing groups to match your org structure, and share payment methods. Customize your order approvals, set spending limits and manage your organization's buying on Amazon. Use your corporate purchasing cards or arrange a line of credit. Share payment methods across your organization. Track and monitor spending within your organization with dynamic charts and data tables. Manage authorized purchasers, set spending limits and approve shopping carts before users buy. If your organization is eligible for tax-exempt purchasing, enroll in the Amazon Tax Exemption Program. If you are taking advantage of your exclusive complimentary Business Prime shipping offer, your shipping benefits expire on January 14th. Upon expiration of these benefits, you will not be auto-enrolled/auto-renewed into any paid shipping program, and will be able to choose the shipping option/plan that best fits your needs. We are excited to announce that our Business Prime program now provides benefits beyond shipping such as Spend Analytics and Guided Buying - if you are currently taking advantage of your complimentary Business Prime offer, be sure to check out all the new, exciting business tools and benefits* available exclusively to Business Prime members. You will be able to enjoy these benefits for the remainder of the complimentary period ending January 14th. If, after January 14, you choose to not move forward with a paid Business Prime program, you will be able to take advantage of free standard on orders over $25. *Public Sector plans and pricing are available to U.S. federal, state, local, and regional government entities, public education organizations, non-profit private universities, and public healthcare organizations and facilities with over 100 users on their Amazon Business account. Cancel anytime. Membership fees may change over time. The Public Sector plan is priced at $3,499 per year compared to $10,099 per year – please contact your customer advisor to learn more. How do I purchase from Amazon Business via OMNIA Partners? Is there a cost? Amazon Business customers must be registered as participants of OMNIA Partners in order to use the contract. Please Register to Participate. There are no costs, minimum quantity requirements or spend limits with OMNIA Partners or to create an Amazon Business account. Register for a FREE Amazon Business account by clicking here. Already have an Amazon Business account and registered with OMNIA Partners? Please enroll to use the contract by completing the contract enrollment form below. Complete the contract enrollment form by clicking here. Once you complete the form, an Amazon Business Customer Advisor will contact you within three business days to complete the registration process. What is an Amazon Business account? Price discounts: Access price and quantity discounts reserved for Amazon Business accounts on more than 7 million items. Tax-exempt purchasing: If your organization is eligible for tax-exempt purchasing, enroll in the Amazon Tax Exemption Program. Payment solutions: Choose the payment method that works best for your business, whether it is a purchasing card or line of credit. Enable spend controls: Manage authorized purchasers, set spending limits and approve shopping carts before users buy. Reporting and analytics: Track and monitor spending within your organization with dynamic charts and data tables. Purchasing-system integration: We are enabled as a catalog on more than 30 leading systems. Configure your system and start shopping. Learn more. My state has bid requirements. Can agencies in my state use this program without going out to bid? This contract has been competitively bid by Prince William County Public Schools, a public agency. Through the Joint Powers Authority or an inter-local agreement, local and state agencies can "piggy-back" this competitive bid contract through OMNIA Partners. This satisfies the competitive bid requirements in most states. See state statutes on intergovernmental purchasing. How do I know if my agency has already adopted the Amazon Business contract? Please complete the contract registration form by clicking here. Once you complete the form, an Amazon Business Customer Advisor will contact you within 3 business days. What are the benefits of the Amazon Business and OMNIA Partners contract? Amazon Business has everything you love about Amazon with the compliance you trust from OMNIA Partners. There are no minimum spending requirements; no cost or commitment. What categories can be purchased on Amazon Business through the OMNIA Partners contract? Are there any states excluded from using the Amazon Business contract through OMNIA Partners? All Amazon Business customers registered as participants of the OMNIA Partners purchasing cooperative are able to use the contract. Amazon Business has everything you love about Amazon, tailored to serve all organizations, including state and local government agencies, public and private K-12 school districts and higher education organizations, and nonprofit businesses. 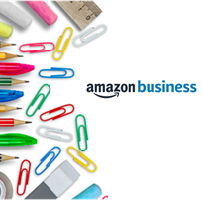 Amazon Business offers a competitive selection of hundreds of thousands of office supplies products. In this category you will find all you need for your office essentials, including office organization, writing instruments and accessories, shipping supplies, binders, calculators, notebooks and pens, ink and toner, and much more. At the time of contract award, Amazon carries key brands such as Amazon Basics, Staples, ACCO, Nestle, Pilot, Boise Paper, Office Depot, Avery, Expo, 3M, Five Star and more. Amazon Business carries a broad range of classroom, school, art supplies and materials including a vast selection of millions of items for professors, teachers, and students from kindergarten to college. Top brands in this category include Learning Resources, Fiskars, Business Source, Singer, 3M, Swingline, and much more. Amazon Business offers access to millions of products in this category including items from top brands in such as Hoover, Rubbermaid, Whitmore, Honeywell, OXO, Bissell, iRobot, Sterilite, Starbucks, Clorox, Keurig, Celestial Seasonings, Georgia Pacific, and much more. Amazon Business is the world’s largest bookstore offering titles from key publishers and hard to find authors. Amazon’s broad selection covers all categories used in the classroom such as: textbooks, fiction, non-fiction, professional development and easy reading. Top publishers include Kaplan, Houghton Mifflin Harcourt, Pearson, Scholastic, Penguin Random House, McGraw-Hill Education, etc. K-12 professional development includes titles from publishers and authors such as Robert Marzano, Solution Tree, ISTE, and more. Amazon Business selection of hundreds of thousands of musical instruments include everything from harmonicas to bass drums! Top brands in this category include Gibson, Epiphone, Yamaha, Numark, Casio, Behringer, Blue Microphones, Shure, Marshall, Pioneer DJ, Fender, Universal One, and more. With millions of products in the Amazon Business audio and electronics equipment category, you are sure to find everything you are looking for. Top brands in this category include Panasonic, Apple, Bose, Philips, Sony, Sennheiser, Samsung, Amazon Basics, Ultimate Ears, Anker, Aukey, and more. From glassware to spectrometers and microscopes to filtration apparatus, Amazon Business has a vast selection of scientific equipment. Top brands in this category include Bel-Art, AmScope, Corning, Kimble Chase, Wheaton, Ample Scientific, American BioTech Supply, Boekel, Grant, iChromatography, National Scientific, Chemglass, Cole-Parmer, Agilent Technologies, Thermo Scientific, BenchPro, CeilBlue, EDSAL, Salsbury Industries, United Scientific Supplies, Heathrow Scientific, and more. Top brands in this category include Levi’s, Calvin Klein, Lucky Brand, Under Armour, Tommy Hilfiger, Nautica, Hagger, Perry Ellis, Lee, Disney, BCBCMaxazria, Hugo Boss, Lacoste, and more. Amazon Business has the animal supplies from some of the most trusted names in pet nutrition, including Purina, Kaytee, Fancy Feast, Penn-Plax, Pure Aquatic, MarineLand, Petmate, Sherpa, BestPet, and much more. Our marketplace offers hundreds of millions of products from a wide variety of industries and specialties including 3D printing, commercial espresso machines & coffee makers, cutting tools, material handling equipment, packaging and shipping supplies, pulling & lifting supplies, and much more. 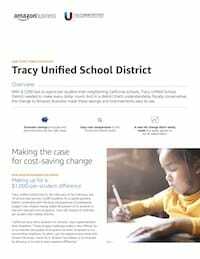 Learn how Tracy Unified School District makes every dollar count through the Amazon Business cooperative contract.